정몽주(鄭夢周, 1337～1392)는 고려 말기문신이자 학자로 본관은 영일, 호는 포은이다. 1360년(공민왕 9) 문과에서 장원급제한 뒤 예조정랑, 대사성, 대제학, 문하찬성사 등의 벼슬을 지냈다. 1389년에는 이성계와 함께 공양왕을 세웠으나, 조준, 정도전 등에게 이성계를 추대하려는 계획이 있음을 알고 이들을 제거하려다 이방원에 의해 선죽교에서 죽음을 맞이하였다. 의 화면 왼쪽에는 가정(嘉靖) 000고본(皐本)‘ 오른 쪽에는 '포은(圃隱)000상(像)’ 이라고 쓰여 있다.『포은집』을 참조해 보면, 왼쪽 상단의 표제는 ‘가정을묘임고본(嘉靖乙卯臨皐本)’일 것으로 짐작되며, 따라서 1555년(명종10)에 이모된 본으로 추정된다. 『포은집』(권2, 엽8) 화상 항목에 의하면, 정몽주의 초상화는 1390년(고려 공양왕2)에 공양왕을 추대한 공으로 佐命功臣에 책록되어 입각도형되었을 때의 본이 처음이라고 한다. 현재 이 원본은 전해오지 않는다. 이 원본으로부터 이모한 본들이 임고서원과 경기도 용인시 모현동 포은선생영당, 전라남도 장흥군 용강영당, 국립중앙박물관(이한철 중모본)과 서울대학교 박물관(초본) 등에 소장되어 있다. 이들 정몽주의 초상화는 모두 이모본이기는 하지만, 애초 동일한 본(좌명공신도상)으로부터 모사하였으므로 상용형식(像容形式)이 모두 동일하다. 그런데 1555년(명종10)에 좌명공신상으로부터 직접 이모한 본이 임진왜란 후 너무 해어지고 버지게 되자 1629년(인조7) 당시 서원의 유림들은 새로이 모사하도록 하였으며, 1629년에 제작된 이 은 현재 보물 제1110호로 지정(1991년 12월)되어 있다. 지금 이 경기도 박물관 소장 은 1555년에 이모했던 구본(舊本)으로 추정된다. 그 동안 영일정씨 종가에서 줄곧 소장하고 있다가 2006년에 박물관에 기증하였다한다.
. 화폭은 3폭이 결봉(結縫)되어 고식을 보이고 있다. 2007년 수리시 뒷면을 확인한 결과 사모, 얼굴, 단령 뿐 아니라 족좌대(발받침대)에 이르기까지 넓게 배채하였음을 알 수 있었다. 초상화는 오사모에 단령을 입고 공수자세를 취하고 있는 좌안 9분면의 전신교의좌상이다. 흑색의 사모는 帽頂이 낮고 둥글며, 좁은 兩角은 아래로 쳐져 있다. 단령을 원래는 靑袍였을 것으로 추정되지만, 현재는 퇴색이 심하여 거의 회색계열로 보인다. 목선이 밭으며 소매통이 좁은데, 이런 형태는 고려말에서 조선초에 걸쳐 나타나는 특징이다. 허리에는 鈒金帶를 두르고 있다. 얼굴은 옅은 살색을 주조로 하였으며, 눈, 코, 입의 일부는 박락되어 있다. 특히 왼 쪽 눈은 반도 안남아 있을 정도로 박락이 심하여 특히 유감스럽다. 갈색 필선으로 이목구비와 얼굴 주름만을 간략하게 형용하였다. 오른 눈을 보면, 검은 선으로 위 아래 눈꺼풀을 형용하였으며, 눈 안쪽에 아주 옅게 담묵을 칠하고, 홍채도 담묵으로 처리하였다. 아래 위에 속눈썹은 전혀 그려 넣지 않았다. 코의 형용은 어느 정도 보이며, 입은 어두운 적색을 묘사하였는데, 윤곽선을 따라 담묵으로 덧그었으며, 입술색은 아주 흐리게 칠하였다. 또한 단령의 윤곽선과 주름은 가늘고 예리한 묵선으로 묘사하였으며, 양 허벅지 사이로 흘러내리는 주름 선들은 세로 선과 가로선을 교차시켜 단순하게 표현하였다. 의자에는 북은 방석을 깔고 있는 것으로 보이며, 의자에 비끄러맨 맨 자색의 방석 끈이 눈길을 끈다. 족좌대 위에는 흑피화를 신은 발이 같은 방향으로 나란히 놓여 있으며, 족좌대 윗면과 바닥에는 아무 것도 깔려 있지 않다. 복제와 모제, 그리고 얼굴의 간결한 묘사와 의자의 방석 끈, 같은 방향으로 놓여진 양 흑피화, 단령의 트임 사이로 첩리와 답호가 겹겹이 내보이는 점 등은 전체적으로 등 고려말 조선초의 공신도상에서 살필 수 있는 특징을 보여준다. 이 작품은 한국의 대표적 문인이자 충절의 인물인 정몽주의 초상화라는 점에서주목될 뿐 만 아니라, 비록 고려말 조선초에 제작된 원본은 아니지만, 원본의 양식적 특징을 충실히 반영하고 있는 조선중기로 올라가는 이모본이라는 점에서도 주목할 만하다. 그 동안 가장 오래된 정몽주 초상으로 알려져 왔던 보물 제1110호본 보다도 70년가량 앞선 정몽주의 초상화라는 점에서 문화재로서의 가치는 충분하다고 본다. A distinguished Neo-Chonfucian scholar and civil official of late Goryeo (918-1392), Jeong Mong-ju (pen-name: Poeun, 1337-1392) passed the state examination in 1360, starting a successful career in the government as a mid- and high-ranking posts in the Ministry of Rite (Yejo), State Confucian Academy (Seonggyungwan), Directorate of Education (Bomungak), and the Chancellery (Munhaseong). In 1360, he joined Yi Seong-gye (1335-1408, later King Taejo of Joseon) to enthrone King Gongyang (r. 1389-1392) for reformation of dynasty but, discovering a treasonous plan of Yi and his close aides, such as Jo Jun and Jeong Do-jeon, fiercely confronted them which eventually led to his assassination at Seonjukgyo Bridge. The portrait has postscripts on both sides, suggesting that it was copied from the original in 1555. According to The Collected Writings by Poeun (Poeunjip), his original portrait, which is now missing, was painted in 1390 when he was awarded a title, Jwamyeong Subject of Merit, for his role in the enthronement of King Gongyang. 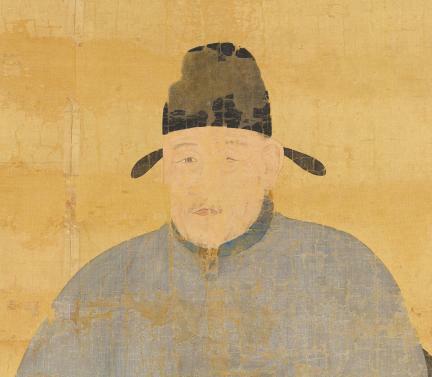 Several imitations have been made from this 1390 portrait to be enshrined and collected in Imgo Seowon, a private Confucian shrine-academy in Yeongcheon of Gyeongbuk, Memorial Shrine for Master Poeun in Yongin of Gyeonggi-do, National Museum of Korea, and Seoul National University Museum in Seoul. Originated from the same original work, titled Portrait of Jwamyeong Subject of Merit, these portraits exhibit the same style. As the official portraits directly copied from the original in 1555 became worn out through turbulent times, the government allowed his memorial shrines across the country to have new portraits which appeared in 1629. One of these copies was designated as Treasure No. 1110 in December 1991. This particular portrait of Jeong Mong-ju currently in the collection of Gyeonggi Provincial Museum is believed to have been one of the copies made in 1555. It had been kept by the head family of the Yeongil Jeong clan until 2006 when they donated to the museum. 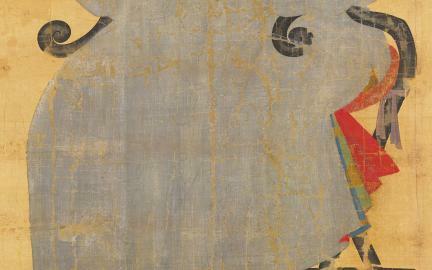 The support of this portrait is prepared by sewing three pieces of cloth together, displaying an antique style. An examination of the backside of the painting for repair in 2007 revealed that colors were applied not only to the headwear, face, and robe but also to the foot rest. In the portrait, the sitter is in a black satin headwear and round-neck robe, and seated on a chair, facing slightly left. The black official’s headwear is marked by the low, round crown with slender drooped “horns”. The robe is almost gray although the original color should have been blue, and displays characteristic features of those made between late Goryeo and early Joseon with the collar rather tight around the neck and comparatively narrower sleeves. The belt is decorated with gold ornaments. The loyal official depicted in this portrait is also characterized by light peach face with the paint slightly peeling off around the features, particularly the left eye. The artist used brown lines to outline the features and depict wrinkles, and light ink wash to depict the iris in the eyes although eyelashes are not rendered. The lips are rendered with dark red and outlined with ink wash. The outlines and folds of the robe are depicted with fine, and rather sharp, ink wash lines which are applied in a simplistic manner. The sitter is seated on a red seat cushion which is tied to the chair with purple strings, and wears black leather shoes both of which facing the same direction. There is nothing either on or under the footrest. The simple rendering of the face, seat cushion attached with tying strings, black leather shoes facing the same direction, and the sleeveless inner coat worn inside the robe are the elements characterizing the portraits of meritorious subjects produced between late Goryeo and early Joseon as shown by the portraits of Yi Cheon-u (?-1417) and Yi Saek (1328-1396). This portrait is regarded as an important item of Korean artistic heritage not only because it renders Jeong Mong-ju who is widely admired as one of the Korea’s earliest and greatest Neo-Confucian scholars and eminent historic figure symbolizing loyalty but also because it retains the artistic style of the mid Joseon works copied from his original portrait painted in the late Goryeo period. Its value as artistic heritage may be succinctly summed up by that it was made about seventy years before the Treasure No. 1110 which had been wrongly conjectured as his oldest remaining portrait.